PSCo and NEC recently supported a charity battle of the bands at the Newsroom’s Got Talent 2013 show, by providing an on-stage videowall as well as smaller viewing screens for the audience to capture every moment of the evening. The annual star studded talent competition took place at the O2 Arena in London on October 10, and has raised a massive £150,000 to date for Leonard Cheshire Disability and UNICEF charities. On the night performances included news teams from ITN, ITV News, Daybreak, Channel 4 News, Channel 5 News, Sky News, Al Jazeera and British Forces News, and were staged in front of a live audience. The impressive 4x4 videowall was created by PSCo using 46" NEC X463UN displays and was installed and configured by PSCo to show exciting videos and images throughout the evening, providing a spectacular background to the celebrity performances. Additional screens from PSCo were also positioned around the arena showing live feed of the on-stage talent show, ensuring the entire audience could be involved with the entertainment. 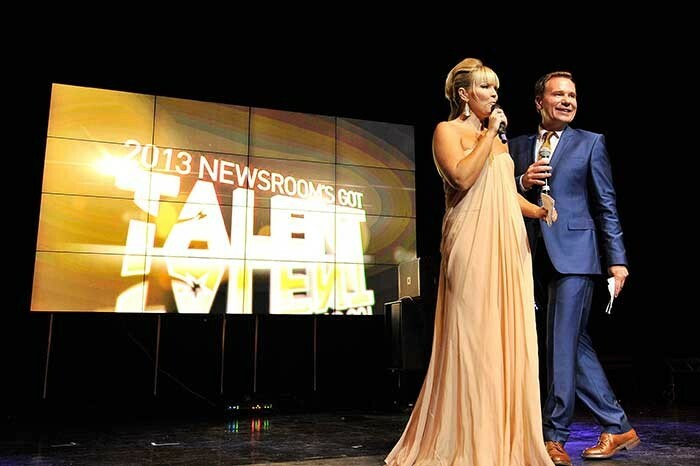 The creator and driving force behind Newsroom’s Got Talent and producer at ITN, Erin O’Toole, said: "Thank you so much PSCo for supporting our event by donating the use of your amazing screens; they were absolutely brilliant and made such an impact." Stuart Holmes, CEO of PSCo said: "This was a fantastic night and we had great fun. It was very rewarding to be involved in such a great charity show, and I was delighted to see the NEC videowall on the main stage delivering background imagery to the news teams we are used to watching on TV every day." The 16 NEC X463UN 46" LCD displays used to create the videowall offer full 1080p HD resolution, an ultra-narrow bezel and direct LED backlighting for improved uniformity between the screens. PSCo installed, set-up and calibrated the videowall and multiple screens throughout the arena, providing on-site technical support to ensure the displays produced the highest quality possible for an outstanding and high-impact performance. During Newsroom’s Got Talent 2013, the nation’s favourite news teams from across the TV networks stepped out from behind their desks in a series of glamorous or hilarious costumes to compete against each other. Teams performed a variety of singing and dancing acts in an attempt to wow celebrity judges Pete Waterman, Cheryl Baker, Nancy Dell’Olio and Rylan Clarke, with the ITV News ‘Broadcast Queens’ team scooping first place by performing a colourful medley of Abba songs.